Subrosa Falcon Association - Where's My Rabbit? 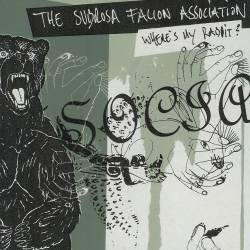 Every time I read how megastars like Metallica spend years in studios to find their sound, I become totally mad, especially when a young fresh band like Subrosa Falcon Association only took five days to record their album Where's My Rabbit?. Of course it's unfair to compare them to Metallica, SFA are much better and rock harder, but it proves that with the right attitude you can not only get a perfect sound but even the near-perfect album. What I love most about this band is the radically direct approach. Just being your typical power trio, they release torrents of energy that you wouldn't expect from three young Germans. Maybe it's because the recording sessions were in sunny Italy, I can't explain otherwise how they manage to combine snotty rock'n'roll (thinking of T(I)NC) with a more punkish angularity (like the Jon Spencer Blues Explosion). Bass and drums are wild and unpredictable, actually just plainly wonderful, but it's the unrestrained guitar sound that makes listening to SFA such a revelation. You get everything from straight out rockers (Chunk) to swerving indie outbursts (Ex Ex Ex) and even more contemplative sounds (Shitlock Detroit). Combined with the gorgeous digipak, proving that you can make art with only black, white and two shades of grey, we nearly forget that overall the album is maybe a little short and could have gained from two or three more songs. But what we have is beyond any doubt some great punk rock'n'roll indie music that has even the ability to please to a lot of different fan areas.